CARROLL GARDENS — Kimchi Taco, best known as a food truck, has a second brick-and-mortar location in Brooklyn. Owner Phillip Lee opened Kimchi Grill at 478 Smith St., just steps from the Smith-Ninth Streets F/G subway stop. The restaurant that opened its doors Monday is bigger than Lee’s first Prospect Heights location, with about 19 seats and a larger kitchen. The bigger cooking space allowed chef Michael Calderon to add a few dishes to the popular menu. Sliders and skillets will be added to location's brunch menu, which features Korean fried chicken and waffles, breakfast tacos and burritos. The Korean noodle dish gook soo will be prepared in the new kitchen with seasonal vegetables, sesame oil, Korean pepper paste and of course, kimchi. “We just didn’t have the right equipment [at the Prospect Heights location,]” said Lee, who opened the Washington Avenue Kimchi Grill location in 2012. Earlier this year, Community Board 6 approved a full liquor license for Kimchi Grill. Lee is waiting to receive the license, but plans to serve cocktails and beer. The Grill, which will offer takeout and delivery, will also serve the Kimchi Taco Truck's popular eats like tacos, bowls and burritos. Lee brought the restaurant to Carroll Gardens in hopes of providing an eatery more family-friendly than the Prospect Heights location. He said his personal mission is to popularize Korean food “and showcase it to the world." There are more than 200 types of kimchi. 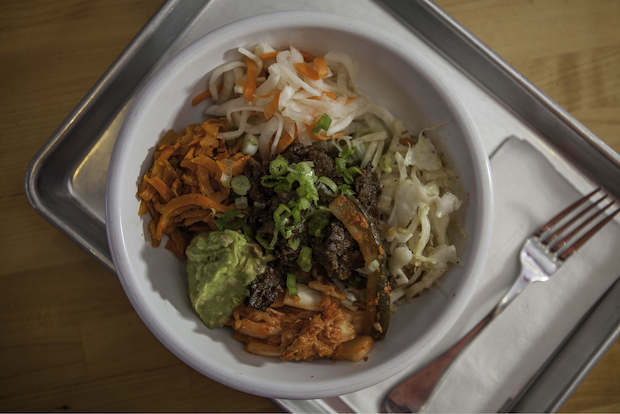 Lee and Calderon, who have been working together for more than three years, try to incorporate the Korean staple’s distinct flavor into almost all their dishes.